Now that the cold is starting to spread across most of the Northern Hemisphere it is the time to plan your next beach vacation to the less known beaches in Southeast Asia. Undiscovered places in the region are hard to find. Being such a backpackers destination, Southeast Asia is filled with restless souls looking for relaxation under the sun. These are 10 beaches in Southeast Asia without the crowds. I am not talking about completely deserted places, but about beaches with fewer tourists and less popular than the typical Phuket and Bali. Phu Quoc is an island on the Southwest part of Vietnam, actually off the coast of Cambodia. It is a popular destination for Vietnamese but still waiting to be discovered by the rest. Half of the island is considered a national park and is covered in thick jungle. Head away from the main town into Ganh Dau Beach for the quieter bits of the island. Where to stay on Phu Quoc: Recently opened Salinda Resort is a good choice. You can check their rates here. Another good option is La Veranda, with a colonial feel to it. Latest rates here. Nusa Lembongan is a quieter island off the Southeast of Bali located in a group of three islands. It is known for nice beaches and also because of the possibility to dive with large Mola-mola fish, a few times larger than a person. Life on Nusa Lembongan is remarkably relaxed and backpacker-ish. Since you need to take a ferry from Bali, it is less known than the big islands brother, but hurry up because tides are changing and it is becoming more and more popular. Where to stay on Lembongan: Lembongan Beach Club and resort is the poshest place to stay for a few days away from Bali’s noise. Check the latest prices here. St. John’s and Kusu are two islands off the coast of Singapore. The little island-state may not be known for its beaches, after all, the sighting of hundreds of container ships slowly drifting in front of your eyes is not a particularly relaxing or beautiful sight. But don’t give up. Singapore has a long coastal area yet the best kept secret are the Sister Islands in the channel between Singapore and Indonesia’s Batam and Bintan Islands. If you take a ferry from Singapore, you will be on St. John’s island within 30min and there, the white fluffy crescent Lazarus beach awaits. You will share the area with the various yachts taking locals on an afternoon cruise. Not too bad. Where to stay on St. John’s Island: There are not formal accommodations on the island but you can rent a hut from the Singapore Parks authority here. Combine your stay at one of these luxury hotels in Singapore or quainter boutique hotels in Singapore! Perhentian Islands are relatively lesser known as a quieter than other parts of Malaysia but, if you truly want to get away from it all and have a relatively peaceful island to yourself, head to the Baby Islands where you can enjoy pristine corals and quiet tiny bays. You can get there by a 15min boat ride. Rent a fisherman’s boat from the beach. Where to stay on the Baby Islands: Thankfully, there isn’t any accommodation on the islands themselves so you will have to stay on Perhentian. Bubu is the most decent and grown up of the options on the quieter stretch of Long Beach. Latest rates here. The Philippines is Asia’s most underrated destination but this will probably change soon as the government and tourism board have finally realized the potential of the country to become a main tourist destination and have kicked off serious campaigns following the “It’s more fun in the Philippines” initiative. 7,000 islands make this friendly country in the eastern most part of the continent. With so many islands, there is no doubt there will be as many beaches to take your breath away. One particularly unknown one is Malapascua. Usually on traveler’s itinerary to see the thresher sharks that inhabit the tiny island, this is also a beach bum paradise. The waters and the beach are some of the most postcard perfect you will ever see and you can get there from Cebu which is connected to various international airports. Where to stay on Malapascua: Most people come here to dive so dive resort prevail. Stay at Malapascua Exotic Island Dive and Beach Resort here for stunning beachfront location or at Malapascua Legend Water Sports and Resort here. Find more luxe options of where to stay in the Philippines, as well as our top picks of the best beaches in the Philippines here. Ok, so I am in love with the Philippines and trust me, you will as well if you visit. I could have written the entire article on the best unknown beaches in the Philippines! Caramoan is about 500km from Manila in Bicol province, and a little haven waiting to be discovered. I may regret spilling the beans… but it was already made famous by various Survivor series from Israel to Sweden. Where to stay in Caramoan: The only proper hotel is Tugawe Cove Resort. You can find the latest nightly rates here. Rawa is a tiny speck known only, it seems, to Singaporean expats looking for a cheap and cheerful getaway. It is also very close to the more well-known Tioman Island. You get there from Mersing ferry terminal, about 3-4h drive from Singapore and the resorts are simple and affordable but the beaches are the best you can get. Where to stay on Rawa: Rawa Island Resort is the place. Latest pries here. Previously completely undiscovered to tourists but slowly appearing in the traveler’s map, Koh Rong is an island off the Southern coast of Cambodia. It is harder to reach, with road transfer required from Phnom Penh keeping it relatively less popular with weekend getaways. The island is about 25km from Sihanoukville. Although the area may be showing clear signs of over development and lack of care for the environment, you should venture away from the main tourist area to find the quieter parts. Light conditions are favorable tophosphorescent plankton, a starry sky in the water. Where to stay on Koh Rong: There is only one high-end place in the area, Song Saa. Song Saa defines the word eco-responsible and intelligent luxury with its over water villas and beautiful views. If you can afford it, your experience will be sure to linger well after you leave. Check latest rates here. Indonesia is a large country and there are many, probably hundreds, of unexplored beaches where you will share the sand with the crabs. 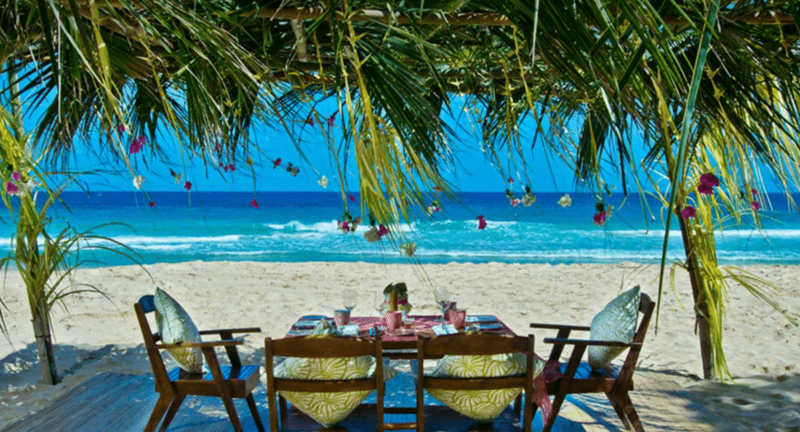 Sumba may be on the up since Nihiwatu has opened a new Robinson Crusoe super lux resort. Apart from that, it is just locals and massive waves for surfers to enjoy. It is primarily undiscovered and can be accessed by plane from Bali. Here’s my video of this amazing place. Where to stay on Sumba Island: Owned by shoe designer Tori Burch, Nihi Sumba (formerly Nihiwatu), is no doubt, the place to stay, if you can afford it. It will change your definition of luxury forever. I stayed there in 2017 for my birthday. Read my unbiased review here (I funded the trip myself, so it really is an unbiased review). Check latest prices here. Many divers will have heard of Similan. Thailand’s prime diving destination is a popular live aboard option for those looking for sightings of big fish, manta, sharks and even whale sharks in season. 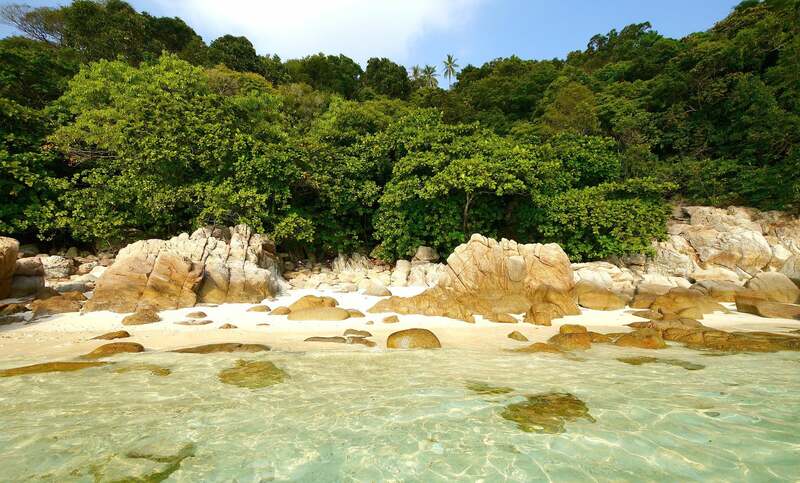 But the less visited Surin Islands are a great option for a stay in nature. The beaches and bays are some of the prettiest in Thailand. Where to stay on Surin Islands: Most visitors come just on a day’s tour os sleep on board but a stay on the islands is possible either on bungalows or on camping grounds. You can book through the Thai National Parks Authority here.